8 November 2018, at 12:00a.m. Swiss research shows ramps can improve transition from one phase to the next. The transition from rearing to laying can be a stressful time for a young laying hen. Following transport to her new home on the layer farm, she must quickly acclimatise to the environment around her by figuring out where to eat, lay and perch. In the laying environment flocks are often mixed, which means she’ll also have new roommates to contend with. The beginning of egg production is marked by a change at the hormonal level, which means she’ll have to manage all of these challenges while her body goes through changes too. To make matters worse, sometimes the new habitat is so different from the rearing environment that the shock of transition becomes a further source of stress for the bird as it adjusts to its new home. Under the supervision of Michael Toscano, poultry researcher Ariane Stratmann of the Center for Proper Housing, Poultry and Rabbits (ZTHZ) in Switzerland is looking at the challenges of cage-free, tiered aviaries and has shared her preliminary results on how to make the transition from rearing to laying smoother. Difficulty transitioning is not a single problem, Toscano said in a recent interview, but a catch-all term for lots of issues. Besides transport, hormonal changes – including the strange new sensation of desiring to find a safe and secure place to lay an egg – and being re-grouped, this broad set of issues includes navigating the new environment and finding resources such as food and water. "This needs to be considered among other factors. For instance, ramps over the litter are likely going to contribute to build-up of faeces and ammonia"
In an ideal situation, layers would be moved to an environment that is similar to the environment where they were reared where lighting, feeding and housing are much the same. This, however, is not always possible. Stratmann recommends visiting the rearing farm and talking to the producer to see if it is possible to adjust accordingly. One of the big challenges in tiered cage-free housing is that birds have to move from one level to the next to feed, perch and lay. Those that have never done this before may have difficulties with the transition. When kept in aviary systems, pullets and layers must move through a three-dimensional environment. The design of tiered aviaries means that birds will have to move vertically – sometimes for the first time – which can be difficult to do since they’re not good at flying. Hens prefer to walk and jump, explains Stratmann. Currently, Stratmann is working on figuring out what the ideal rearing and laying environment should look like. She suggests with confidence that ramps could improve movement through high-traffic areas, like the nest box. The Swiss researchers are also looking at lighting to see if lengthening dusk duration would allow the birds more time to find a roosting position. Preliminary results from Stratmann’s study suggest that a longer dusk duration leads to fewer failed landings. Adding ramps in laying aviaries has been shown to reduce problems regarding movement in an aviary, affirms Stratmann. Ramps also have the potential to address associated health problems – fewer falls and collisions lead to fewer keel-bone fractures – probably because they provide a continuous path connecting the different tiers of an aviary and allow birds to walk up and down instead of having to jump or fly down, which means they might crash into walls and other hens. Until now, ramps have not been tested in rearing aviaries, but the researchers assume they would be beneficial in terms of how the chicks distribute and develop in the aviary. They believe having access to ramps from an early age will lead to a more even distribution, which should result in better access to feed and water. Ramp access from an early age could also aid in improved cognitive development and increased bone health and strength due to the added physical exercise and in providing the opportunity to move up and down on an incline. “Preliminary results show that pullets reared in an aviary with ramps have wing bones that are stiffer and less prone to deform under pressure compared with pullets reared in aviaries without ramps,” says Stratmann. “Also, laying hens that were reared with ramps and had access to ramps in the laying aviary had fewer keel-bone fractures and fewer footpad problems than hens without access to ramps either during rearing, laying or both. Stratmann still needs to fully analyse the data, particularly to see what happens after the age of 35 weeks. 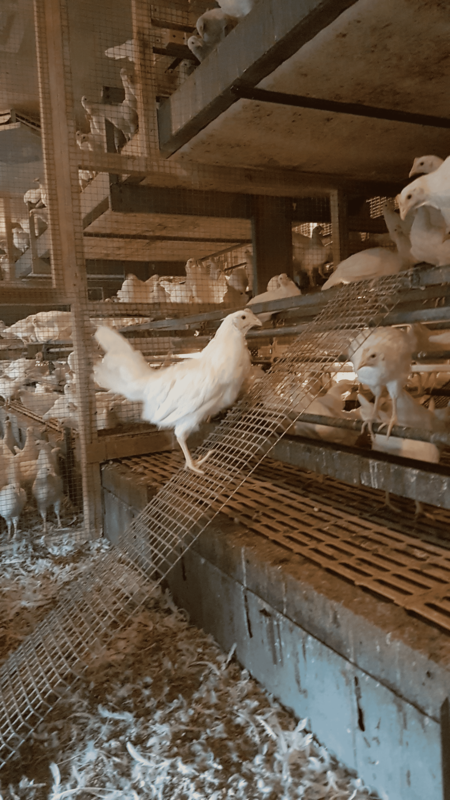 “Ramps are cheap and easy to install in any type of aviary system and due to their various benefits for pullet and laying-hen welfare we recommend them to every poultry farmer,” she concludes. ZTHZ is a collaborative effort between the University of Bern and the Federal Food Safety and Veterinary Office.